Ready for Mamma Mia on Broadway! 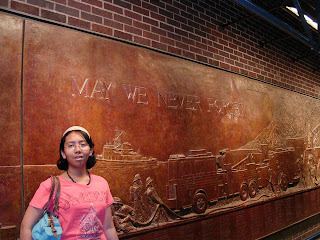 The day we arrived in NYC, we checked in the hotel and my mum's friend, Dr. Susilo who was in NYC on Fulbright scholarship as well took us on the Subway and we went to Ground Zero. The ex-WTC site was still full with cranes and stuff and rumours had it that they were planning to build another one but after 6 years, nothing much seemed to happen. There was a wall near the site to commemorate the deaths of firefighters who died while trying to save other people lives during the 9/11 event. There was a whole lot of names of firefighters and there were images depicting the whole incident and it really touched my heart to see how many people were willing to put other people's lives ahead of them and I wish I could just be like them. You know, less self-centred and everything. 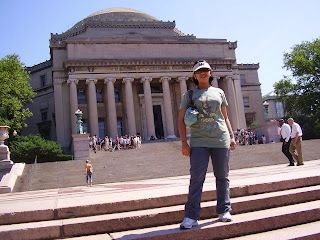 The next day, we got up early and head over to yet another university, Columbia University, one of Ivy League universities. Columbia was fine though I think Harvard was much better. 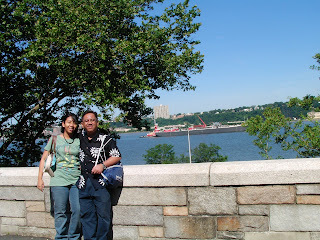 The uni was not that spacious but I kinda like it cause it was so near NYC, my fave city. ;) We had brunch at Riverside Park which was just down the road. 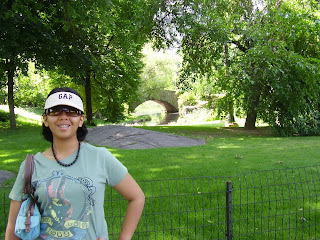 After brunch we took the Subway to Central Park. Very green. They even had a mini theme park there and it was free! For a second, I was hoping to go on the Ferris wheel and the water slide but the long snakey line where only 5 year old kids were lining up made me change my mind. 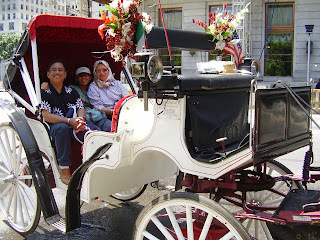 But we did go on a horse ride around the Park. No offence but the horse smelled like poop and pee! I'd always wanted to watch a Broadway show and that day was my lucky day when my parents purchased 3 tickets to watch Mamma Mia, a musical based on ABBA songs. The play was fine but I liked the songs. I'm a big fan of ABBA songs now! 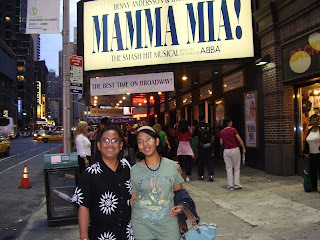 Mamma Mia....here I go again.....lalalala..
42nd street Times Square had always been my fave of NYC. It was so vibrant, so full of people and life. Even after 12am, the street was still alive with all those colourful, animated neon signages and people still walking around the street. I definitely like it here! It was a sad thing but we had to leave NYC the next morning to go back to Ithaca. Never mind, I'll be back, hopefully. NYC, the city that never sleeps. Darn right it doesn't!